A car has been driven through the side of a garage in a suburban street by a driver who fled the scene. 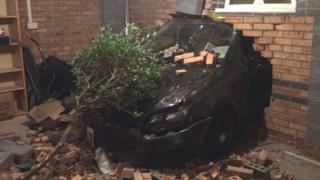 The vehicle smashed into the brick building on Kingfisher Close, Brownhills, West Midlands, at about 05:40 BST on Saturday. West Midlands Fire Service said no-one was injured although the structure of the garage had been "compromised" by the crash. Police said they were investigating the incident and trying to find the driver. The car has been recovered from the garage and insurers for the property are assessing the damage.